WE Give You The 2019 Midlands Riders Tops Every Year We Have Refreshed The Tops & This Time For 2019 We Have Gone With The Comments Made By YOU The Members For More Options : Now We Give You “ 3 “ Versions! THERES MORE ‍♂️ Not Only That; In Celebration Of Our 5th Year As a Diverse National’ Ride Out Group We Now Offer For The First Time Since Opening: “ Colour Hoodies Will Be Available “ These are available online in pull over only. We Will also continue with The iron on names: On the Website Please See “ YOUR NAME “ Listing: Which Is For Anyone That Wants There Name On Their Top We Can Supply A Iron On Version & We Will Send With Your Top. No one HAS’ to have a hoody, Jacket or T shirt. Every member can come to ANY ride or Event without a top, it is NOT a must & these are all freedom of Choice. 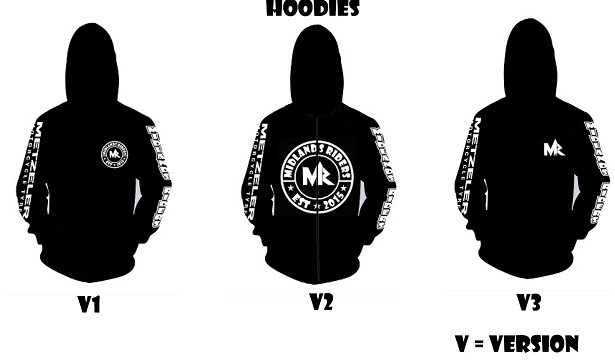 Only down side you can not gain discount with sponsors without a hoody. All items are made to order via a outside company & not by Midlands Riders: please see the website for full information.